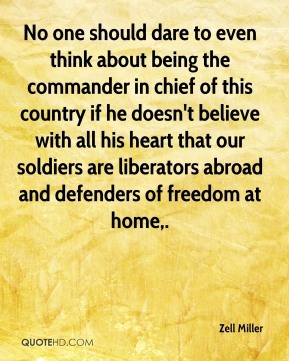 It is the soldier, not the reporter, who has given us the freedom of the press. 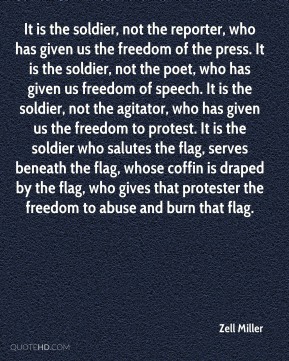 It is the soldier, not the poet, who has given us freedom of speech. It is the soldier, not the agitator, who has given us the freedom to protest. It is the soldier who salutes the flag, serves beneath the flag, whose coffin is draped by the flag, who gives that protester the freedom to abuse and burn that flag. 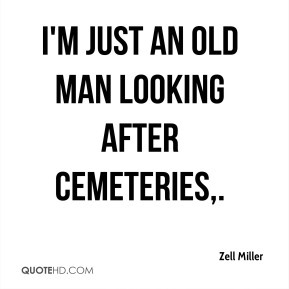 I'm just an old man looking after cemeteries. I got to thinking, 'Hey, this is something I've always been interested in -- military history, ... 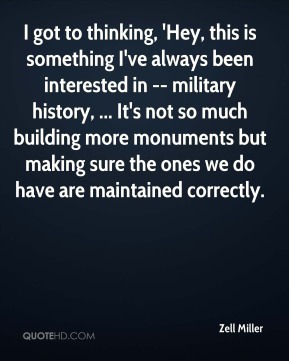 It's not so much building more monuments but making sure the ones we do have are maintained correctly. removed prayer from our public schools . 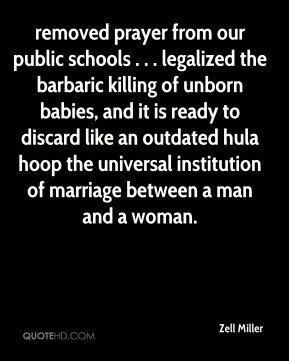 . . legalized the barbaric killing of unborn babies, and it is ready to discard like an outdated hula hoop the universal institution of marriage between a man and a woman. 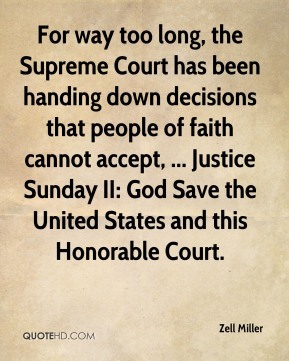 For way too long, the Supreme Court has been handing down decisions that people of faith cannot accept, ... Justice Sunday II: God Save the United States and this Honorable Court. Cover this confirmation process with prayer, ... 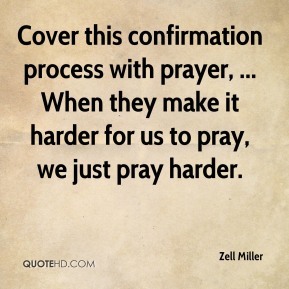 When they make it harder for us to pray, we just pray harder. 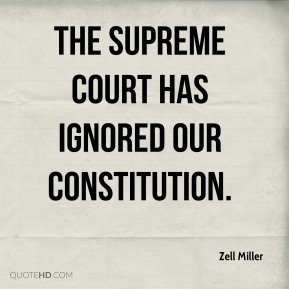 The Supreme Court has ignored our Constitution. 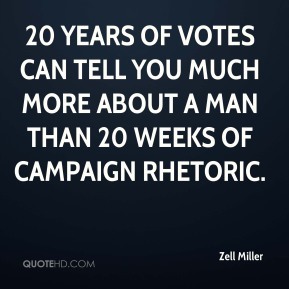 20 years of votes can tell you much more about a man than 20 weeks of campaign rhetoric. 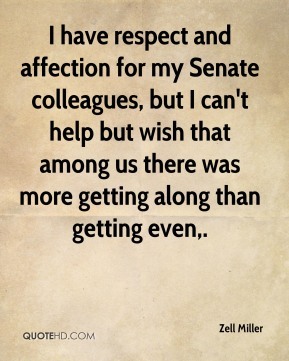 I have respect and affection for my Senate colleagues, but I can't help but wish that among us there was more getting along than getting even. 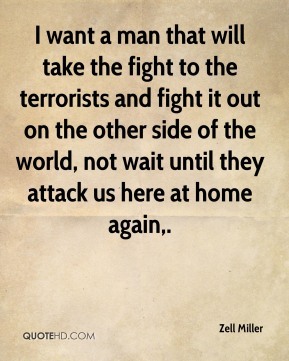 I want a man that will take the fight to the terrorists and fight it out on the other side of the world, not wait until they attack us here at home again. The Democratic Party today has gone further and further to the left. 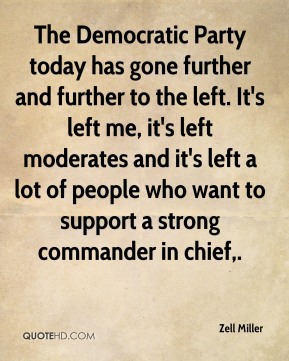 It's left me, it's left moderates and it's left a lot of people who want to support a strong commander in chief. 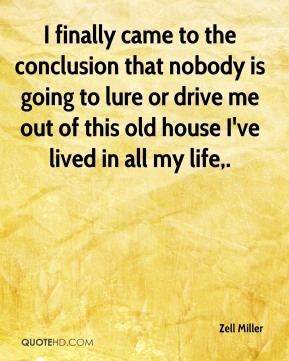 I finally came to the conclusion that nobody is going to lure or drive me out of this old house I've lived in all my life. 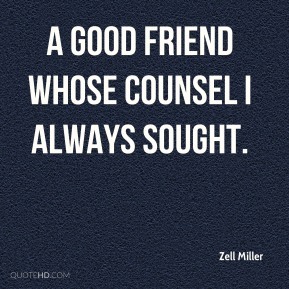 a good friend whose counsel I always sought. 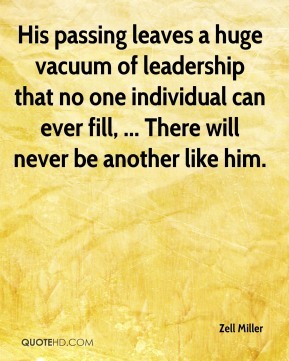 His passing leaves a huge vacuum of leadership that no one individual can ever fill, ... There will never be another like him. I'm interested in passing a prescription drug benefit. Anything short of that will be failure. 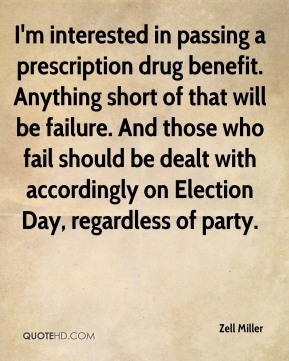 And those who fail should be dealt with accordingly on Election Day, regardless of party. 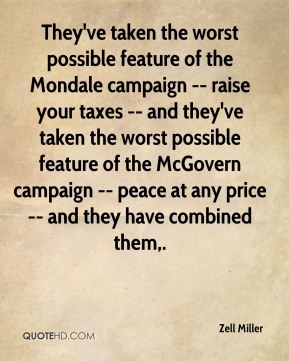 They've taken the worst possible feature of the Mondale campaign -- raise your taxes -- and they've taken the worst possible feature of the McGovern campaign -- peace at any price -- and they have combined them. In their warped way of thinking, America is the problem, not the solution, ... 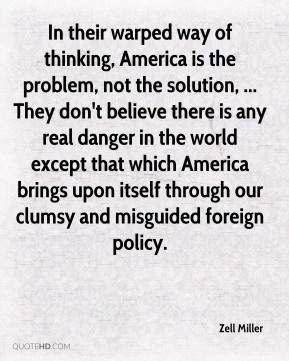 They don't believe there is any real danger in the world except that which America brings upon itself through our clumsy and misguided foreign policy. 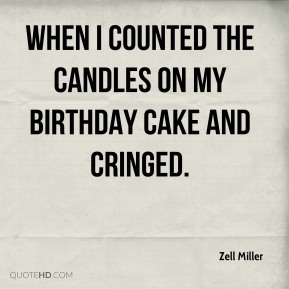 when I counted the candles on my birthday cake and cringed. [Sen. Zell Miller, D-Georgia, wrote Bush to offer congratulations.] 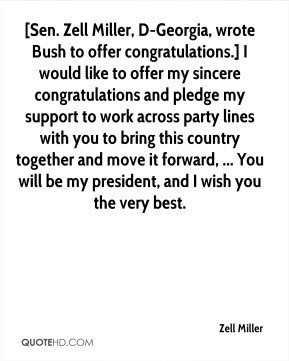 I would like to offer my sincere congratulations and pledge my support to work across party lines with you to bring this country together and move it forward, ... You will be my president, and I wish you the very best. talks like Dirty Harry but acts like Barney Fife. 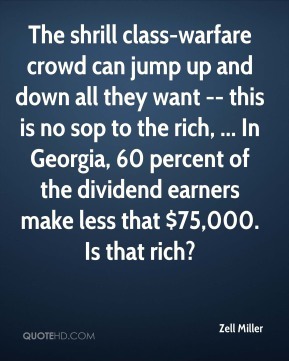 The shrill class-warfare crowd can jump up and down all they want -- this is no sop to the rich, ... In Georgia, 60 percent of the dividend earners make less that $75,000. Is that rich? 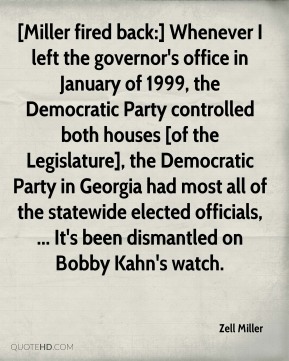 [Miller fired back:] Whenever I left the governor's office in January of 1999, the Democratic Party controlled both houses [of the Legislature], the Democratic Party in Georgia had most all of the statewide elected officials, ... It's been dismantled on Bobby Kahn's watch. There is a war being fought. 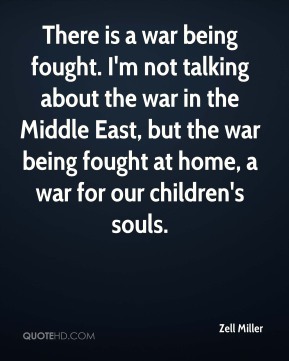 I'm not talking about the war in the Middle East, but the war being fought at home, a war for our children's souls. 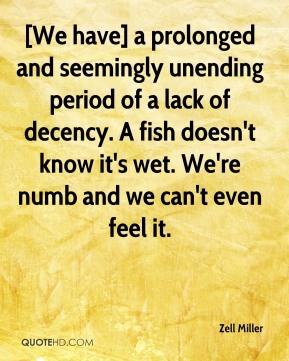 [We have] a prolonged and seemingly unending period of a lack of decency. A fish doesn't know it's wet. We're numb and we can't even feel it.